The Pittsfield, Massachusetts, auction house Fontaine’s has a track record of selling good examples of horology and has achieved some very high prices recently for elaborate English clocks made for the Chinese market. An English bracket clock by the London partnership of Robert and Peter Higgs and Diego Evans, estimated at $25,000 at Fontaine’s. Among the pieces it is offering in its sale on March 25 will be this 2ft 5in (75cm) high English bracket clock. It was made by the London partnership of Robert and Peter Higgs and Diego Evans, who were at Exchange Alley between 1775 and 1825. 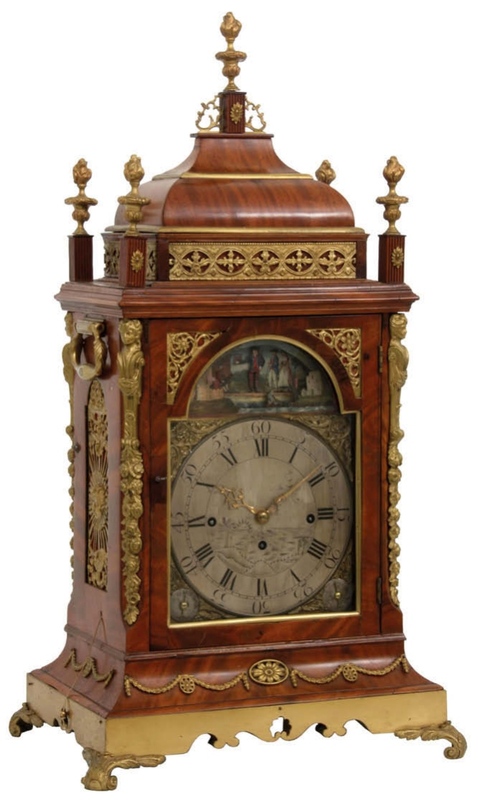 The mahogany cased clock, which is signed on the back plate, features a triple fusée movement, plays a selection of four tunes on the hour and features an automaton in the dial arch of a violinist with a dancing man and sailing boats. It has an estimate of $25,000.